Weapons Disaster? Holy cow, what a bleak title. 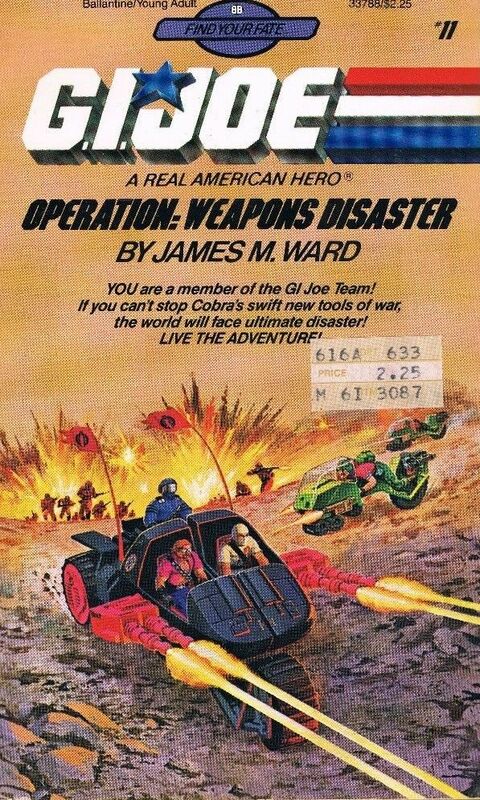 I wonder if said disaster is in reference to the Cobra STUN, one of the strangest villainous vehicles of all time, and also the sort of mad contraption that only could have come about in the 80s. After all, it’s the same decade that produced this. Not to be outdone, the Joes join the fray in their own bit of two-wheeled whimsy, the LCV. Whenever I see one of these things portrayed in media, I have to think that the Joes intended the main function of the ride not as a below-the-radar infiltration device, but as a way to distract the enemy by keeping him doubled over in laughter.Seeing the two vehicles together on the battlefield makes me wonder if the story might be set in a Bizarro World alternate universe, in which they were more popular than their HISS and RAM counterparts. Storm Shadow & Monkeywrench… an odd pairing. The title fits the S.T.U.N very well. Considering its crew is completely exposed and it can olny hit targets on its side by splitting in half which exposes the crew further. Who is Bazooka engaging? He clearly missed the class on pincer movements. I like the LCV is being manned by Bazooka, while the other LCV is being manned by …….. Bazooka?!? Trigore from the Power Lords line… Yeah, that was something more in tune with the 60’s. Wayne Barlowe’s designs looked like the result of an acid trip gone seriously wrong. I had both of those vehicles back in the day. I liked the STUN a bit because it kept the classic Cobra color scheme. As an intended successor to the original HISS tanks? Not so much. That’s probably why the HISS II showed up three years later. I didn’t care for the LCV at all, though. I think I only got one for the mini-catalog since it was the first new vehicle I’d found for ’86. I wouldn’t be surprised if the cover artist had Clue ZERO about the G.I. Joe story and just drew whatever figures and vehicles they were presented with. I recently read #1 of this book series (“Siege of Serpentor”), and even author RL Stine couldn’t save the book. No clue what most of the characters and equipment should be like, including real-world gear (like the “MP5 assault cannon”). The covers really are the best parts of these books!